This wonderful Idaho rafting trip came at the perfect time for me. I wanted / needed a "vacation", a get-away where time slows down. 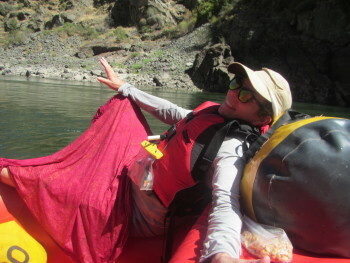 I found just what I wanted on a Lower Salmon River trip. No need for cell phones, you won't get any service (though I did use mine for taking pictures while in airplane mode). This was going to be the beginning of the vacation I was looking for! 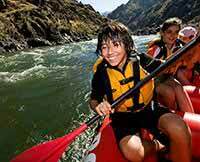 For me, a rafting vacation is one where you can have adventure on the water in the rapids, sleep comfortably in camp, play and swim in the river and make new friends. I did all of this and more! We saw wildlife like Big Horn Sheep, Golden and Bald Eagles, Wild Deer and a brief sighting of a Sturgeon! I paddled a few different days, relaxed on an oar boat for a day and even found myself in a 2 person kayak with my new friend Jodie! The food was delicious. We had Salmon, Chicken, Lasagna and Prime Rib for dinner. Pancakes, made to order Omelettes, French Toast and Eggs Benedict for breakfasts. Lunches were great as well, deli meats, cream cheese spreads, chicken salad and so much more! This particular trip was a "Family Magic" trip with 4 different families and kids from 7 - 14 years old. I was amazed how well they all got along and had fun with the River Jester, Lily. Thanks to our guides, Cayla, Will, Bethany, Anna, Jonas, Connie and Lily, it was well done! This is one trip I look forward to doing again and again!